Here is a slightly corrected, modified version of my previous concept. The reasoning being, with these kind of voltages, the more straightforward the logic, the better. a). The cathode current of the GM70 is routed by redundant sets of incandescent light bulbs (= Power PTC resistors), but these are bypassed by hefty capacitors, so as to AC-bypass the PTC nonlinearities, but not only to boost AC gain, but foremost to eliminate the risk of the filament temperature being modulated by the changing AC signal. A changing filament temperature “flashing” to the beat of the music, would imply rythmic resistance changes, and that would mean serious nonlinearity and serious distortion. The bypass cap works like a “battery” of sorts, keeping a steady DC voltage on the light bulbs and hence “fixing” their resistance to a predetermined and constant value. b). Capacitor C1 closes the Ultrapath trace, by which the AC signal can now travel along a very short loop, encompassing just the three elements: the GM70, the transformer primary, and C1 itself, thereby “discouraging” the AC signal to stray and roam around any further, such as through the capacitors of the filter of the anode power supply filter. c). The AC voltage divider consisting of C1 and C2, C10 determines a specific fraction of the power supply hum / noise signal, as introduced by the less-than-perfect B+. This hum signal is taken from the 1700 VDC B+ and a fraction of this hum signal it is inserted upon the cathode of the GM70. Now, since the amplification factor of the GM70 will be roughly about 5, we would therefore need to take about 1/5 of the hum signal to the cathode, so that 5 * 1/5 = 1 … Essentially, we are looking at the golden optimum point, where a fraction of the hum, as introduced to the cathode, gets amplified, and appears at the anode and the transformer primary, but in-phase to the hum coming down from B+ to the other end of the transformer primary. Hence, the transformer primary becomes “immune” to the hum – it simply “does not see it”, as it appears equally on both of its taps at the same time. Precise trimming would need to be recalculated and tested via trial and error. In essence, I see the potential here to get an “Aikido” effect, resulting in fighting Hum with Hum, and using this Aikido strategy, to obtain a very high Power Supply Rejection Ratio of the hum of the B+ supply as provided to the output stage. d). The current from the cathode of the GM70 is routed via the PTC bulbs, and then via the secondary transformer winding to ground. The back-EMF, as generated on the output terminal by the naughty speaker, will be fed back, to the cathode of the GM70 in the form of a negative current feedback. The current flowing through the secondary and the speaker itself will actually provide the cathode of the GM70 with a current based error signal. This way, I am hoping to linearize both nonlinearities of the output tube, but also the nonlinearities of the transformers iron core. Last but not least, I am also hoping to correct and account for the error signal being a result of a misbehaving speaker load. e). The lower tap of the secondary winding is connected directly to ground. The winding itself has a low DC restistance. Therefore, the fact that the upper end of the secondary winding is connected to the cathode of the output tube is not really dangerous. Fret not, that the tube is run off a voltage of 1700V DC, as only a very small fraction of that voltage shall ever appear on the output speaker terminal. f). R4 and R7 are used as a kind of “protection” against a situation where both fillaments of the redundant light bulbs blow at the same time, resulting in an open circuit. Without the “path” to ground, a not-so-obvious voltage could be formed on the cathode, potentially creating a hazard of those bypass capacitors blowing up. The idea is that, if albeit the burnt fillament of the bulbs, the resistors shall create an alternative path for a trickle current from cathode to ground, and hence allowing to create a high bias voltage that would cut off the output tube completely. g). R12 is a “traditional”, negative voltage feedback series resistor, routed from the output terminal of the speaker to the cathode of the input tube. h). The input tube is supplied with it’s anode voltage from a non-standard source of voltage. It is supplied via R5 from a voltage of about 300V … DC in a sense, but not really, because this is actually the 1/2 voltage of the 600V supplying the the mu-follower. A voltage taken directly from the OUTPUT of the mu-follower. 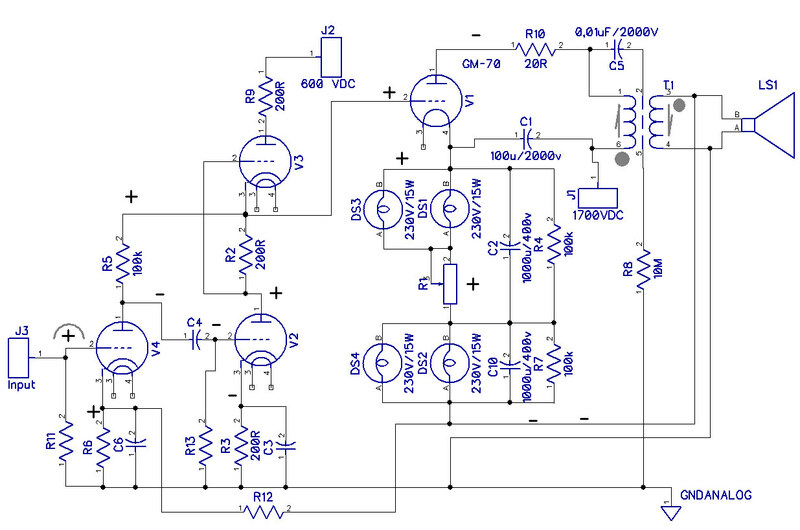 Essentially, it is a “jumping” 300V, modulated by the output signal of the mu-follower stage. i). The jumping voltage is applied to the anode resistor R5 of the input tube L1 and this voltage is in anti-phase with the output voltage as seen directly on the anode of the input stage. Essentially, we have the effect here of a certain amount of negative feedback between the mu-follower output and the B+ supply of the input stage. Sort of weird and non-obvious, but nonetheless, it is there and most probably it will work quite fine. j). If the jumping voltage as in h) and i) turns out to make no sense, or shall prove to be “unusable”, then I shall just add one or more RC filtering stages just prior to R5 and cynically “use” the 1/2 level voltage of the mu-follower stage to obtain 1/2 of 600V and use this to power the input tube. The RC network will “filter out” the AC component, and then will provide me with a “useable” DC voltage to power the input tube. k). 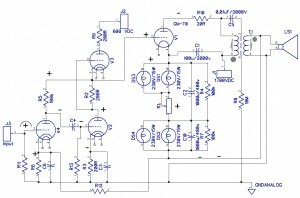 The standing current of the input tube shall be much smaller than the standing current of the mu-follower, so this current “theft” should not destabilize the operating point of the mu-follower too much. From the point of view of the mu-follower, the upper tube will simply be operating at a slightly higher current than the lower one, that is all. If need be, I shall empirically adjust the value of the upper tubes cathode resistor, so as to obtain the desired “equilibrium” and equal DC voltage split. l). The variable resistor R1 is used to precisely set the output tubes bias and resulting DC conditions. This Resistor, however, does no longer need be a multi-zillion watts type of bulky device, as it was in the DRD scenario before. In this scenario, a significant part of the “power” is being “lost” on the PTC lightbulbs, so the resistor may now be just for the sake of fine tuning and of a much lower (i.e. reasonable) wattage rating. m). The core of the output transformer is isolated from ground potential. It is happily jumping along with the excursions of the anode voltage. As this component shall be covered in full with a a steel cap anyway, and this cap will be connected to the ground potential, such a solution shall not constitute a health hazard. The voltage supply for the anode circuit of the GM70 would be something like 1680VDC, taken off a CLCLC type filter, after rectification of 1200V AC. The voltage supply for the mu-follower would be something like 600V DC, taken off a LCLC filter, after rectification of one half of the 1200V AC, in accordance to the “voltage” halving trick that I sketchedin some previous blog entry. The voltage supply for the input stage will be c.a. 300V taken from the (filtered?) Output of the mu-follower “DC voltage divider” (sic!). Is it reasonable to go into the hassle of a redundancy of light bulbs, or is such redundancy not necessary? Is it enough if I make a “single” current path through a single string of 230V/25W + 230V/25W bulbs?